Juliet is already wondering whether her live-in boyfriend Will has lost his lust for life -- and for her -- when tragedy strikes: He stands her up. On Valentine's Day. Then some jerk in a fancy car splashes her with icky London rain water, takes a good, hard look at her, and drives away. What's worse he was gorgeous, the kind of guy you dream would sweep you off your feet...or at least remember you on Valentine's Day. On top of having to win a big advertising account at work it's a wonder Juliet doesn't collapse into a puddle herself. To Juliet's surprise, the mystery driver turns out to be an adman named Sykes -- her competition for the hot account -- and he's awfully sorry about the splashing. So sorry that he whisks Juliet away for a romantic weekend in Verona, the storied home of her Shakespearean namesake. A funny thing happens, though. When Juliet gets back, Will's all sweet again and Sykes pitches an ad campaign suspiciously similar to Juliet's. Suddenly it's time for fair Juliet to decide whether she and Sykes are meant-to-be star-crossed lovers -- or whether Romeo has been right by her side all along. 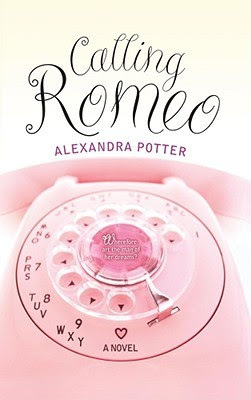 I do enjoy Alexandra Potter’s novels and so I was expecting this to be similar to her earlier novel, Me and Mr Darcy which I loved, however I was surprised to find that Shakespeare’s Romeo doesn’t actually appear in this novel. It does, however centre around heroine Juliet, but this is where the similarities end. Juliet experiences that kind of irritating complacency which one often experiences at that certain point in a relationship and so finds herself looking for solutions elsewhere, which is where she lands herself in trouble. I have to admit that I don’t enjoy books as much when infidelity starts to creep into the storyline, whether it is actual infidelity or just suggested infidelity. I find the read becomes slightly more uncomfortable and that I have to put the book down and walk away for short periods of time. The overall storyline of the book was Potter’s usual mix of modern romance and features what I have discovered to be a common theme in this authors novels, the theme of second chances. It’s hard not to give away too much of the storyline so I can’t say much more than that. Fans of Alexandra potter will not feel at all let down by this novel; it has strong characters, and a well developed storyline. It steps away from the magic and mysticism that crops up in most of her earlier novels, but is still something which will inspire emotions in the reader. I enjoyed it, it made me laugh and cry which, to me, is always a sign of a good novel! If you haven’t read anything by this author before, I would suggest beginning with one of her other novels and then coming on to this, but if you are a fan of hers then, you won’t feel let down by Calling Romeo!